Well, it only took a 3d pregnancy for my DD to finally experience labor! Unfortunately, since she was scheduled for her c/section on Thursday, and since she has never experienced labor before, this was not a good idea! After one partial day of contractions, which stopped, she started contracting again yesterday. 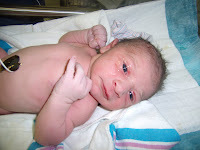 And Luke arrived, via c/section, at just before 6 PM on September 16, 2008. 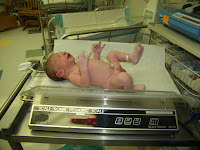 Weighing in at a whopping 6 lbs 12 oz, he is the largest of her 3 boys! And looking him over - I think I know why she went into labor - I am convinced her dates were off! He also has big feet and hands for a guy his size - the most hair of all 3 boys! 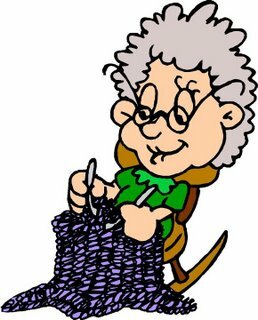 Belated congratulations on your new grandson! Squirrel + Sunflower = ARGHHHH!